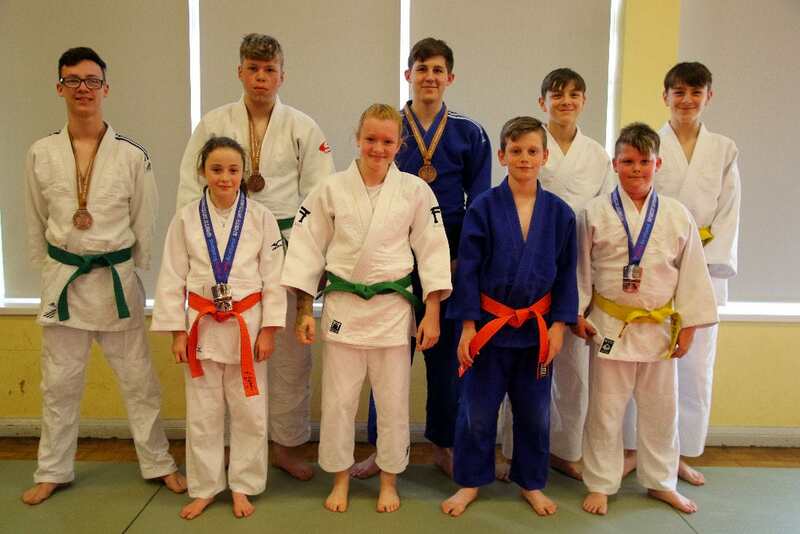 BBattlehill Judo Club attended two major national and international Judo competitions with nine young competitors. The British Schools Competition held at English Institute for Sport in Sheffield attracted 600 competitors over a 2 day event, whilst the Sportif International Judo Tournament in Meadowbank Sports Centre, Edinburgh was well attended by 700 competitors from seventeen countries. Five competitors took part at the British schools event, where Ellie Hutton started the day off winning 3 from 4 contests to secure the Bronze Medal in the year 8/9 girls u48kg category. Josh Stoneman also won 3 from 4 fights, defeated by the year 8/9 boys gold medallist to return with another Bronze Medal in the u60kg event. Kieron Hardaker finished the day with a 3rd Bronze in the 10/11 year Boys u90kg. On day 2 of the event Maddox Fuller fought well in the 6/7 year Boys u38kg and Kieran Tweedy in the 12/13 year Boys u73kg, lost only to the Gold medallist in a pool of 10 to return with a Bronze Medal. Four competitors travelled to Scotland for the Sportif International event, Joe Flaherty secured third place in a tough pool of 5 competitors, Jenni Francis successfully progressed through the group stage and narrowly missed out in the semi-finals; both players took well-earned bronze medals. Luke and Scott Anderson (both 5th Mon) entered the competition having never attended an event of this level previously, both brothers fought excellently and can continue to develop their skills for future events. Very proud of all our players, each giving 100%. Looking forward to our next event British Open National competition in a couple of weeks.